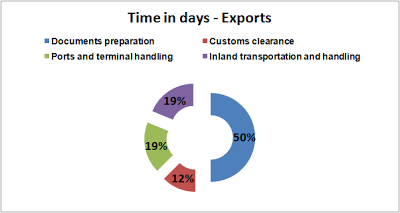 Documentation takes a time of 8 days out of 16 days required to export an average container out of the country. In case of imports, it takes 8 days for documentary preparation out of a total of 20 days required to import a container into the country once it lands at the port. The last major revolution in decrease in transaction time/costs happened between 2007 and 2008 when Indian customs department introduced the EDI system (ICEGATE) for clearance of goods. The corresponding costs associated reflect the same trend. Documentation costs are very high when compared to best practices across the world. However, we are doing better than most of our south asian peers, but that shouldn't be our standards to follow. (Source: Doing Business report 2013 by World Bank, Page no. 92). A look at the average documentary requirements in OECD countries (the best are even better) shows that we are asking too many documents, and which require too much effort to prepare. I don't believe that asking too many documents help in any way to improve administration, duty collection or control and security. It is just bloated bureaucratic requirements playing spoilsport in international business. If Denmark can do with 2 documents, it doesn't mean that they are compromising on security or duty collection. They have simplified their processes and let's try to emulate them. Second task force on reduction of transaction costs was constituted through this year's FTP supplement. I hope that it looks into this aspect seriously. Half of the transaction cost (and time) is locked up in documentary requirements. There is hardly much that this task force can do about infrastructure issues such as roads or ports. What it can actually do, is to take a real hard look on each document that goes into the process of international business from India, and take a sharp axe at most of them. The supplement to FTP was a mixed bag. The highlights of the supplement to the FTP can be accessed here. The blogger had posted about one of the loopholes in FTP where people were importing luxury cars in the guise of capital goods without paying the duty, here. That has now been plugged. EPCG scheme rationalization takes care of that. The SEZs land requirements has been eased, helping smaller SEZ developers. The moot point is, is this the main bottleneck in SEZ development? I believe that unless there is major change in tax policy, SEZ scheme had its day. SEZ scheme is a classic example of inconsistent tax policy. The assurance of a tax free exporting zone was killed the day minimum alternate tax was imposed on the developers and unit holders of SEZs. When the act was made, and people entered into the scheme, the expectation was that it would be tax free for at-least a decade or more if not for ever. The MAT was imposed in 2011, barely 5 years into the scheme. Many of those who put in their money felt cheated. Predictability of taxation regime is important for long term business decisions. Ad-hoc changes, such as this, is not good. Now there is an exit option that has been given in this year's supplement to such units/developers in SEZs. That helps. The blogger is a big supporter of Hi-tech exports from India. Given the talent and availability of cheap labour, we should look into the area of hi-tech manufacturing and exports. The earlier post on M-SIPS in this blog pointed towards it. This incentive would help in that direction. Incentives on incremental exports performance is something that always intrigues me due to the ex-post nature of scheme. If a firm does well, it gets incentives whereas a struggling firm (which actually needs a helping hand) is left behind. During economic slowdowns, such scheme would help firms with relatively inelastic demand of its products (such as Reliance petroleum) against firms that have an elastic demand for its products, and who actually get affected during recessions. 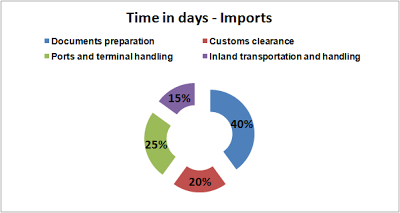 Foreign trade data reporting is something that has been a pain for long. I have blogged about it mainly here, and also here and here. Some promise of improvement in quality and timeliness is made in this supplement, but there is no talk of making it available for free, or to present it in an usable format to scholars/researchers. If one doesn't want to spend hard, the only recourse is to refer World bank/UN Comtrade data, which of course, has a big lag. The supplement also talks about e-brc initiative and EDI/EFT, which is a laudable effort of 'last year'. I wonder why it occupies so much space in this supplement. E-everything is the way to go. A point is to be noted about the new task force on reduction in transaction costs incurred for international business from India. The first task force report can be accessed here. The second task force is now open for suggestions, which can be mailed by next month to transactioncost@nic.in. The blogger is planning to send some points. I hope the second task force does not lean so heavily on World Bank's doing business report to come up with its own report. There is still a lot of documentation pain in the system that need smart solutions. So that sums up the review. There are limits to what an incentive doling ministry can do within budget constraints. The supplement is a praiseworthy effort. However, there is a serious lack of research on the actual impact of these incentives. I hope some budget is made for sponsoring such studies in future. Meanwhile, one line in the FTP supplement (point 17.5) caught my attention. It reads "In order to facilitate IT exports, we have extended the facility of work-from-home to STPI/EOUs/BTPs/EHTPs." Really? Was the Govt. keeping a watch on the IT companies, for all these years, if all employees worked from office premises only, and not remotely login from home? What an idea Sir ji. You are just 15 years behind the times.